Today my design wall has all the purple scrap blocks I got done for the month of February. I have been working on the Rainbow Scrap Challenge 2013 over at Soscrappy. Every Saturday there is a link to post your progress on using up the colour of the month. February has been Purple. I have not done much else but working with my scraps. 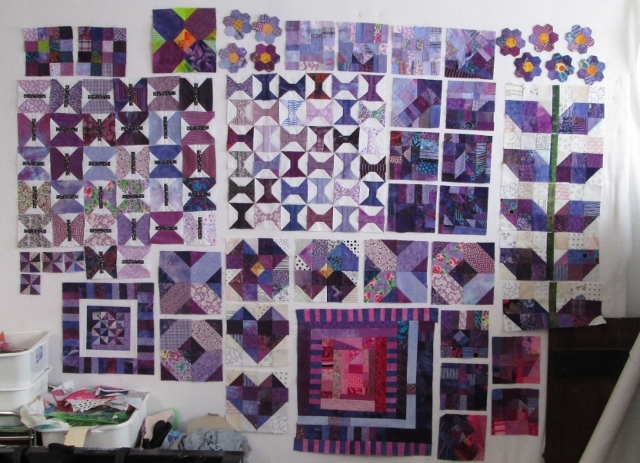 I am going to have enough blocks to make at least 6 quilts, maybe more if I make smaller quilts. If you see a block and want to know more about checkout Links to Scrap Saturday, I have links to were I found the patterns for many of the blocks. 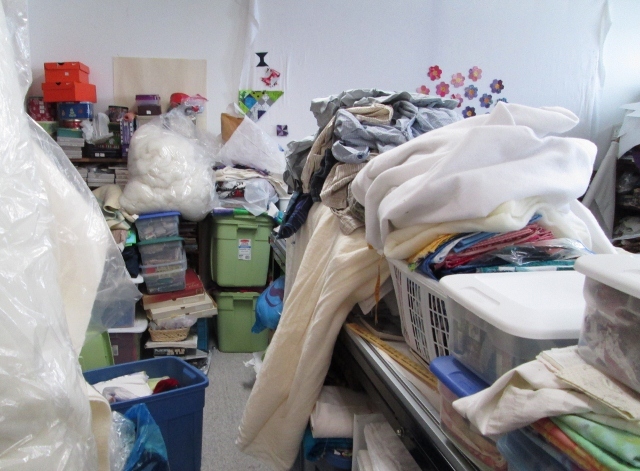 I did some cleaning in my sewing room. The long arm is holding many things that were on the floor, you know it gets messier before it is cleaner. I was trying to take inventory of some old UFO's. I have a couple of big quilts that just a a few days of work and then they would be ready for quilting. I may have to work on one of the older UFO's. Oh boy, you have been busy....things are looking amazing! I absolutely LOVE the butterflies!! And the leaves with the stems. Are you going to put flowers on the top of all the leaves?? They kinda remind me of hollyhocks. That is a lot of blocks for one month. Wow Cathy!!!! What a lot of purply goodness :*D I'm not sure which blocks I list best.... hmmmm..... let me see..... hmmm.....Nope I just can't decide! You definitely got a lot done this month! Way to go, girl!!! love your stack of purple sprouts. I must get my little purple sprouts loaded and onto the linkup.